1. Opening/Show Opening, 2. Boogie Woogie Stomp, 3. Boogie Woogie Instrumental, 4. Roll em Pete, 5. Cherry Red, 6. Make Me A Pallet On Your Floor, 7. Drowning In My Own Tears, 8. Roomin House Blues, 9. Worried Life Blues, 10. You Never Can Tell, 11. Don t Lie To Me, 12. 13. Shake, Rattle & Roll, 14. Band Introduction, 15. Bring It On Home To Me, 16. Down The Road Apiece, 17. Little Queenie, 18. Can I Get A Witness, 19. Hi Heel Sneakers, 20. Watching The River Flow, 21. Boogie 4 Stu Trailer, BONUS FEATURES: 22. Ben Waters Video Footage 1, 23. Ben Waters Video Footage 2. 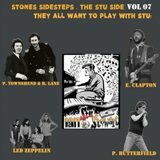 It has recently leaked from Ben Waters himself that the Ambassadors Theatre shows in London early this March have not been filmed professionally; this release by Jointrip presents the most complete version of the Stu Tribute s special night when former friend and colleagues of the late Stones piano player assembled. 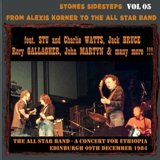 Together with Charlie Watts band the ABC of Boogie featuring also Dave Green on double bass, Axel Zwingenbergen and Ben Waters on piano that was the house band other guests that joined were Mick Taylor, Bill Wyman, Ron Wood, Maxwell Hamish, Mick Hucknall, Jools Holland etc. 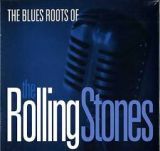 Main music was Boogie Woogie as it was played by Rocket 88, the group Ian Stewart played together with Charlie Watts on his off days when they were not involved in Stones activities. This release presents more than one source, the first is shot from a distance and features Mick Hucknall singing Ray Charles “Drowning In My Own Tears” soon followed by “Roaming House Blues” that had together Taylor,Watts,Wood and Wyman: this is a professional mix of two other sources, one shot from one side of the stage, closer and merged with another source shot from front of the stage with better defined footage. Same line up for “Worried Life Blues” sung by Ron Wood with Taylor on slide while the next song sees Bill Wyman on vocals; on this song another source pops up shot from above the stage. One important point is that the soundtrack which is stereo is continuous and not affected by sources changes; in fact the soundtrack lasts for 18.50 minutes before the first video (“Drowning In My Own Tears”) is on, missing footage is replaced by a slide show that has many comments from Stu s friends about him. More photos of Shakin Stevens performing “Don t Lie To Me” which lacks most of images. The next song, sung by Hamish Maxwell “Shake, Rattle & Roll” comes right before the long band introduction of all players, including Ben Waters son on sax. Mick Hucknall comes back to sing “Bring It On Home To Me”. And drives the audience to add its chorus to the song. We then get 2 Chuck Berry covers: “Down The Road Apiece” a real Stu favourite played by Jools Holland with both Wyman and Green on bass playing with Charlie Watts; at the end of the song the other two piano players join Jools at the same piano. The whole band comes up for “Little Queenie” which sees both guitarists sharing lead duties; halfway through there is also a soundtrack change as it becomes higher in volume and with higher frequencies. According to the Japan subtitles “Can I Get A Witness” is taken from the 2nd show with footage shot from above the stage. The song is ended by Ron Wood but apparently Watts is not of this idea and keeps playing what evolves into “Hi Heeled Sneakers” with all members on stage: there is footage of the final bow as well. We then get “Watching The River Flow” from the tribute album Boogie 4 Stu sung by Jagger (audio only) with Keith Richards and Ron Wood on guitars, Wyman on bass and Watts on drums while a slide show of Ian Stewart photos through the years grace the screen and the promotion trailer for the album. As bonus we get two solo performances by Ben Waters at his piano: the first starts with “Roll em Pete” and the second with “Down The Road Apiece” both showing his ability in playing boogie woogie as a solo act as well. This is certainly the most complete version of the special nights from London s Ambassador Theatre and the best looking too, another great release by Jointrip.